Ed Cortez is an artist, story-teller, and ship model maker. Since January, 2013, Ed’s work has focused on the American Revolutionary War, the ships that helped to win the war, and tales of the heroes of the American Revolutionary War. As an artist, Ed chooses his subjects and constructs his models as works of art, presenting them in a way that they will be appreciated first for their beauty. As a former educator, Ed also wants his models to educate and instill wonder about the ships, the men who sailed them, and how together they contributed to the creation of our Nation. Ed’s ship models are highly detailed and accurate in every respect. Ed also adds features that enhance the viewer’s understanding of the ships that the models represent, such as a figure that gives scale to the Providence or a drawing of the Rattlesnake, pictured above, on the day after she was captured by the British. As a result, any one of Ed’s ships would be as appropriate for a home living room or office as it would be in a museum or corporate lobby. 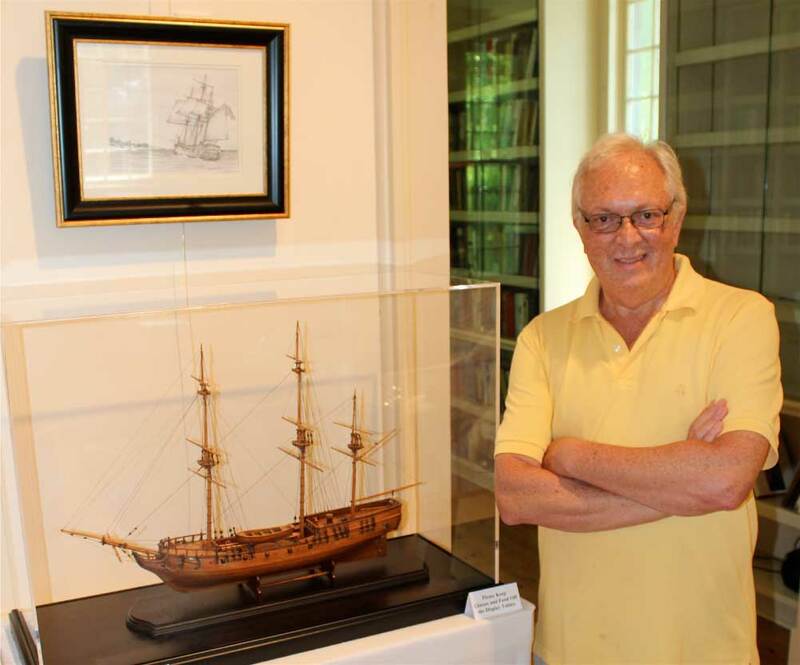 Ed’s ship models have been featured in Vero Beach Magazine September 2018), Dan’s Papers (“Ed Cortez Brings Long Island History to Life,” July 5, 2013) and in House Magazine (“Retirement for Ed Cortez Means Ship Models and Art Shows,” September/October 2013). His models have been displayed at the Remsenburg Academy in Southhampton, NY. Ed is a member of the Board of Trustees of the Cold Spring Harbor Whaling Museum, where he has given a demonstration of the art of scrimshaw. When he lived on Long Island, NY, Ed was a member of the Nautical Research Guild, the Long Island Ship Model Society, the New Bedford Whaling Museum, Mystic Seaport, East End Arts, the Quoque Historical Society, and the Art League of Long Island. A newcomer to Vero Beach, Florida, Ed had his first local show at the Artists Guild Gallery in April of 2016, and has displayed his work in the Vero Beach Museum of Art‘s “Art By The Sea“. Ed is a member of the Vero Beach Art Club; his Art Club banner flies on the Miracle Mile at the entrance to the Publix parking lot and in the window of ABC Printing in Vero Beach. Over the years, Ed has donated artwork to several local nonprofit organizations for their fundraising efforts, including Answer to Cancer, Hibiscus Children’s Center of Indian River County, and the Grand Harbor Community Outreach Program. He volunteers for the Vero Beach Museum of Art’s Education Program, working at the Senior Resource Center of Vero Beach. Recently, Ed’s model of the Continental Navy sloop, Providence, took up residence at the Icon Galeria in Old Town Alexandria, VA to help promote the Providence Foundation’s program to acquire and restore the full scale replica of the Providence. In May of 2018, Ed’s model of the Gunboat Philadelphia was sold to the Smithsonian Institution’s National Museum of American History as a gift from their Board of Directors to John Gray, their retiring Elizabeth MacMillan Executive Director.